Desert Nights - Winner of The 1998 International Academy of Middle Eastern Dance Award for Best Music! Adam Burke and William Warren formed Desert Knights in order to compose and perform new music for belly dancers and as part of their continuing exploration of music from other cultures. They play many original compositions, as well as both popular and traditional Middle-Eastern pieces. 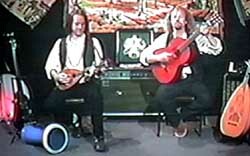 Both Adam and William play stringed instruments including oud, saz, mandolin, and guitars, as well as keyboards, drums, and other percussion instruments. They have collaborated in a variety of musical styles for over nine years. Desert Knights, their current project, has performed since 1997 in a number of settings such as bellydance events, restaurants, art galleries, and on local radio and television programs, including Cox Cable's The Joy of Belly Dancing, hosted by Yasmina. Currently, they are working on their second album as they continue to promote their first album released at the beginning of 1998. Their first album, Desert Nights, was honored as the Winner of The 1998 International Academy of Middle-Eastern Dance Award for Best Music. Adam writes for Zaghareet! Magazine and the Arizona Middle Eastern Dance Association publication. He is a visual artist and musician and a lifelong resident of Phoenix, Arizona. William was also born in Phoenix and currently works and lives at Arcosanti, Paolo Soleri's environmental architectural experiment, north of Phoenix. Dedicated to the Bellydancers of America: The DESERT KNIGHTS album, "Desert Nights," features 11 new original instrumental recordings for belly dance and beyond. Also featured is their new arrangement of the traditional Arab song, "Ay Ya Zein." Combining traditional rhythms, exotic instruments and modern technology, it is world music at its finest. From fast beledi pieces, to sensual masmoudi, to the almost New Age, Desert Knights cover a broad spectrum of danceable sound. It has been well received by belly dancers, and it continues to receive wider recognition both in the United States and abroad among belly dancers and fans of global music. 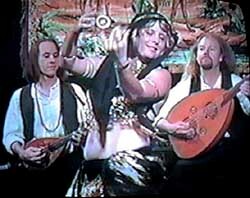 Desert Knights music featured on numerous bellydance instructional video's, including Carrie Konyha's Belly Dance Instructional Video. "As the founder of the bellydance music group, Desert Knights, I am happy to have our music featured on Carrie Konyha's new instructional video for beginners entitled "The Dance -- Volume I," especially so, because of the excellent production quality of this 80-minute presentation. The clarity of sound and video enables Carrie's thorough and effective demonstrations to shine through for the viewer.